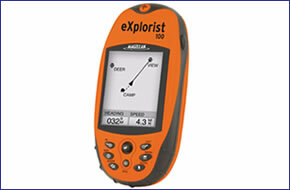 The Magellan eXplorist 100 handheld GPS receiver is both powerful and affordable. The Magellan eXplorist 100 features TrueFix technology which takes advantage of 14 parallel channels, for fast signal acquisition, and accurancy within 3 metres. Accessories, spares and parts are still available for your eXplorist 100. The Magellan eXplorist 100 allows you to save up to 3 track log file, 500 points of interest and 20 routes to guide you back to your favourite spots or more importantly to your car. One button access takes you directly to all of the most important features. Even the first time user can easily navigate with the Magellan eXplorist 100. The Magellan eXplorist 100 uses three navigation screens to display speed, direction, distance to destination and all the GPS information you need on 3 easy to view navigation screens. The Magellan eXplorist 100 Clip Case - eXplorist Keep your Magellan eXplorist GPS secure and right where you need it. Bike Mounting Bracket - eXplorist Conveniently mount your Magellan eXploristT series GPS receiver on your bicycle, snowmobile, or motorcycle. Swivel Mounting Bracket - eXplorist Conveniently mount your Magellan eXplorist series GPS receiver in your car, truck, boat or virtually any vehicle. Vehicle Mounting Bracket - eXplorist Strong suction cups conveniently secure your Magellan eXplorist series GPS receiver to the windshield of your car. The Magellan eXplorist 100 is installed with maps of Europe. Looking for accessories and spares for the Magellan eXplorist 100? Many parts are available including a clip case and vehicle mount.